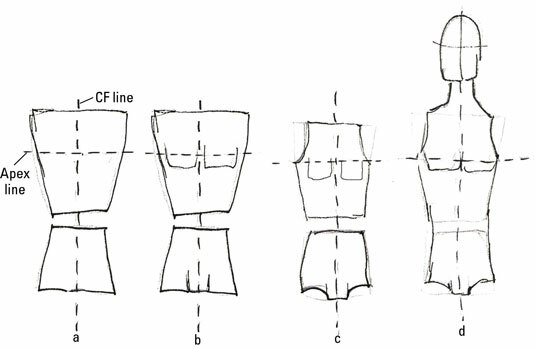 In fashion figures, a couple of trapezoids on top of each other give you the basic idea of the torso’s shape, but you need armholes, leg holes, crotches, breasts, and pecs to turn a shape into a person. Eyeball the proper widths and lengths to get the torso right. And remember that fashion illustration is all about exaggeration, so don’t be afraid to lengthen your torso. Start by drawing two trapezoids that represent the female figure and then mark the center line and apex line. Draw a small V shape for the crotch at the bottom of the lower trapezoid. Add arcs to represent the breasts in the upper trapezoid. The apex line falls halfway through the breast. Cut into the top of the upper trapezoid’s corners for armholes, making sure they end around the apex line. Cut into the bottom corners of the lower trapezoid with downward arcs to make the leg holes. Join the two trapezoids where they meet near the middle of the torso to form the waist. Finish with a long, narrow neck and an oval head. Start by drawing your two trapezoids and then mark the center front line and apex line. The upper trapezoid is taller than the lower, and the shoulders are wider than the hips. The waist is not that much smaller than the hips. For the crotch, draw two sides and the bottom of a small square in the lower trapezoid. Using the apex line as a guide, add some squared off pecs to the upper trapezoid. The apex line falls about a third of the way though the pecs. Cut curved lines into the top of the upper trapezoid’s corners for armholes. The armhole line should end around the apex line. Cut into the bottom corners of the lower trapezoid with downward curved arcs to make the leg holes. Connect the two trapezoids where they meet to shape the waist. Sketch in a wide neck and a head with a square jaw to clearly indicate that you’ve drawn a guy. For a child’s torso, follow the steps for drawing a man’s torso but skip drawing in the pecs and crotch. Children’s torsos are very boxy with little definition at the waist.